#1 – Aspire is actively seeking Remote Customer Service Agents. #2 – Pleio is actively hiring Remote Bilingual Goodstart Mentor. Earn $13-$15 per hour. #9 – Maritz Research is seeking Telephone Mystery Shoppers. #10 – Soft Script is Hiring Medical Transcriptionists. 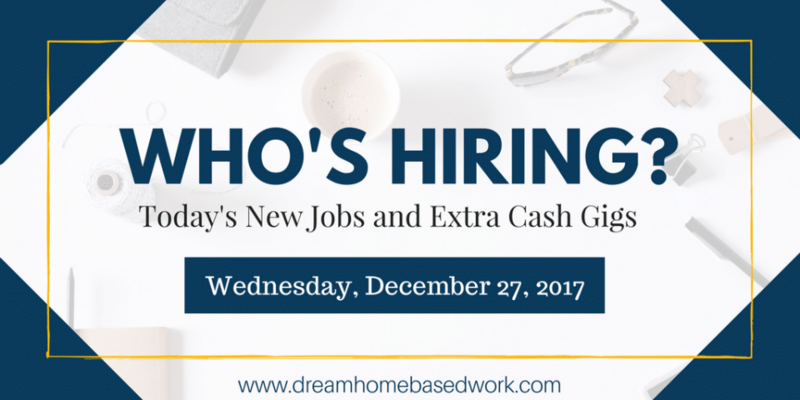 Wondering which work at home jobs are out there? This free work at home directory has more than one hundred listings! #11 – Wide Open Media Group has an open position for a Recipe Writer. #12 – Rev is actively seeking Video Captioners. #13 – Daily Transcription is hiring remote Transcribers. US and Canada. #14 – Fusion Cash is an online platform that allows you to make money from taking surveys, watching videos, shopping, completing short tasks, and much more. Click here to sign up and immediately earn $5.00. #15 – Double Toasted LLC. is in need of a Part-Time Video Editor. Starting pay is $16 per hour. #16 – Translate(dot)com is actively recruiting Work at Home Translators. Multiple countries.